Published January 25, 2019 Filed under Under Our Dome, US News, Utah, Utah Main. Total of 2 comments in the discussion. 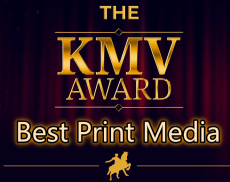 Note: The author and Utah Standard News received the KMV Award for Most Accurate Journalism and Best Print Media in Utah. The nominees included the Desert News, SL Tribune and Standard Examiner. I witnessed a miracle last Saturday. Actually, that statement is not entirely accurate: I was part of that miracle. The First Annual KMV (Keep My Voice) Awards were presented to people who made exceptional contributions in the fight against SB54 (Count My Vote) and to the cause of liberty and freedom in Utah. The event was held at Entrata in Lehi and the near capacity crowd showed their appreciation while being treated to delicious hors d’oeuvres and entertainment. Nancy Pelosi (hilariously portrayed by Cherilyn Eagar) showed up with her portable botox kit and Bon Jovi (played by Phill Wright), sang “You Give Gov a Bad Name” which was dedicated to the numerous overreaches of the 2018 Utah State Legislative session: “With a surplus unreal, almost a billion to steal, but you raised my taxes on Capitol Hill!” The video can be viewed here. 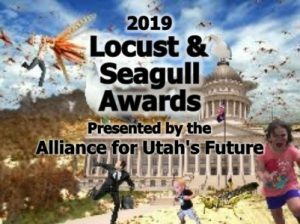 Curt Bramble (Provo SD16), a master politician and nowhere to be seen, earned “The Stinker Award” for his sponsorship of SB54 even though the Legislative legal council reportedly advised the Legislature that the law was unconstitutional. One of the most poignant moments came when Dave Bateman, the founder of Keep My Voice, received the KMV Award. Rather than accept it, he gave it to Layne Beck who began the legal battle against SB54 four years ago and has taken a leadership role ever since. There were lots of laughs. But, interspersed with the brevity was the awareness that the people in that room all made a positive difference in the past year by loosening the grip that Utah’s Swamp-Deep State, ultra-rich Oligarchy, has held over politics and the Republican Party for decades. It was not an ordinary event. It was perhaps the largest gathering of conservative and constitutional policy activists in Utah’s history. 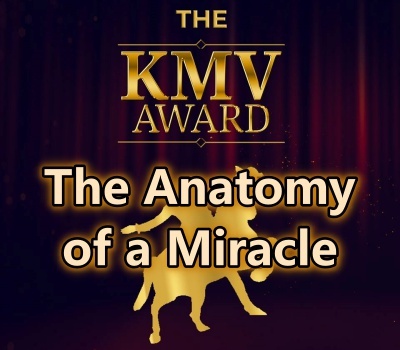 So, why refer to the KMV Awards as a miracle? Because a year ago, the conditions did not exist for this event to happen. Over the past year, thousands of Utah citizens simultaneously felt compelled to stand up and do what they could individually do to protect their own freedoms and the right to control their own destiny. There was little organized effort beyond the SCC’s “Gang of 51” and the Keep my Voice organization, neither of which existed 13 months ago. It has been noted that UtahStandardNews.com played a substantial role by shedding light on the KMV/CMV stuggle and in bringing people together by researching, documenting and publishing the internal UTGOP events that led to the birth of KMV. But mostly, it was neighbor talking to neighbor or attending a caucus meeting and maybe becoming a delegate. Some people ran for public office while others wrote a letter to their editor or called their representative. Some spread the news while others donated massive amounts of time or spent a small fortune. Now, because of those combined efforts, the tide is turning on SB54. Dan McCay, one of the original Legislative sponsors, has talked about repealing the unconstitutional law and the Supreme Court is considering the issue. Former and present elected officials, some of whom supported SB54, have filed an Amicus Brief of Utah Legislators with SCOTUS. What started as an effort by the ultra-rich to usurp and subvert the will of Utah’s citizens has now grown into a national concern with broad support. Utah Sen. Mike Lee, Sen. Ted Cruz, Rep. Raul Labrador and Rep. Rob Bishop have also filed in support of KMV as have the U.S. Pastor Council, Christian Life Center and Layton Christian Academy. 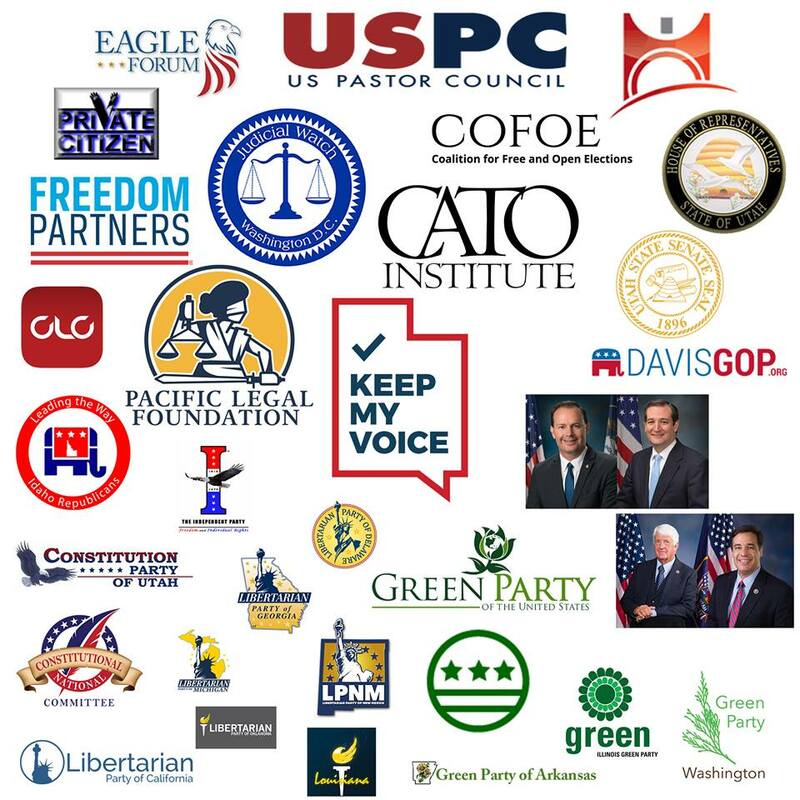 Other briefs include The Eagle Forum Educational & Legal Defense Fund, Judicial Watch and Allied Educational Foundation, the Pacific Legal Foundation, Cato Institute and the Freedom Partners Chamber of Commerce. Local and national political parties also filed including the Coalition for Free and Open Elections, Constitutional National Committee, Utah American Independent Party, American Independent National Committee, Constitution Party of Utah, Idaho Republican Party, and the Utah Native American Caucus. The complete list of 68 signers on the eight amici is included at the end of this article. Regarding this support, KMV issued this statement: “The [10th Circuit] court of appeals’ decision presents a grave threat to the autonomy of civic and religious organizations. If the First Amendment permits a State to dictate the process by which a private political party selects its candidates, then there is nothing to stop a State from meddling in the internal affairs of any other private organization, overriding its Constitution and bylaws in an effort to produce leadership or outcomes more conducive to the tastes of state legislators.” The Amicus Briefs can all be read here on KMV’s website. We may never know the full extent of the damage that Utah’s Deep State has done to extinguish the light of liberty and freedom in Utah. But we do know that they could not have accomplished their goals and agenda without the complicity of Utah’s mainstream media. In that, Utah has not been immune to the collusion we see nationally on a daily basis. Support of SB54 and the constant attacks against KMV by the media have been ongoing since the issue first appeared. We don’t really have a “fake news” problem in Utah. Here, it is more about the untold story and the sloppy, distorted or incomplete information, filled with omissions, incomplete truths, diversions, politically correct distortions and sometimes blatant lies or falsehoods and other forms of deceit where truth is avoided and extreme falsity has become our virtual and simulated artificial reality. These days there is absolutely no shame or stigma whatsoever for running an article which is overloaded with mistakes. The largest media outlets in the state have continually humiliated themselves by publishing articles, opinions and fake polls all in support of the agenda of the ultra-rich. The Deseret News has reportedly stated that they will never publish anything that supports a conservative cause. The SL Tribune (The Wasatch Pravda) has never met a liberal cause they didn’t love. The online Utah Policy, owned by LaVarr Webb and funded by Zions Bank, has been little more than a mouthpiece supporting SB54 and every other cause that the Oligarchy pushes. Interestingly, LeVarr Webb is also the founder of the Exoro Group and one of the creators of Count My Vote. From 2011 to present, Count My Vote and Alliance for Good Government (AGG) has spent $1,848,291.95. $1,345,493.43 (about 73%) of that has gone directly to the Exoro Group. 4 of the 5 founding members of Alliance for Good Government were/are principles of the Exoro Group. This story adds another dimension to the movement. A recent case in point was last week’s Buzzfeed report about Trump and Russia. The media immediately piled on and wildly speculated about the “what if’s” to the point of hysteria until Robert Mueller stepped forward and debunked the claim. To me, Mueller’s inserting himself in support of President Trump was more sensational than the fake news. We’ve seen a similar scenario in Utah with the media’s coverage and vitriol toward KMV, Dave Bateman, the Gang of 51 and any other resistance to SB54. One Utah State Senator, Todd Weiler, even attempted to bribe Bateman’s girlfriend by offering her a million dollars if she would fabricate a sexual harassment claim against Bateman. We also saw the negative media’s reaction when Dr. Mortensen was nominated. The media fell over themselves in a massive barrage of negative reporting and opinion in an attempt to destroy the nomination including telling outright lies that Dr. Mortensen is racist because he believes like most Utahans that legal immigration is good and illegal immigration is bad. Dr. Mortensen has done more to alleviate the suffering of world refugees than all of the bleeding-heart liberals, whiny RINO’s, and soft-socialists combined in the state of Utah. He has never advocated against legal immigration. He has never withheld his aid from any person because of their race, religion, or political leanings. He has never advocated to rip families apart. He has, however, committed the cardinal sin of having concern for the rule of law and the effects that illegal immigration has on American children and their families including the thousands of Utah children who are victims of illegal alien driven identity theft and trying to undo the damage with no help from their government. UtahStandardNews.com covered that in a story Utah’s Media Falsely Attacks DOS Nominee Dr. Ron Mortensen. Congress never got around to vetting Dr. Mortensen so they sent his name, along with about 300 others, back to the White House when the session ended. Last Saturday, UtanStandardNews.com broke the story that Dr. Mortensen’s name was recently resubmitted to Congress and he is now waiting for confirmation. Mitt Romney has been appointed to the committee that will vet Mortensen. Even so, we may still send a real Utahan who is a real conservative back to Washington. The battle against SB54 and Count My Vote is now in the hands of SCOTUS and out of the meddling influences in Utah. The war is not yet won and there are many other battles yet to be engaged but the days of Utah’s media-enabled, entrenched rich and powerful running amuck, by growing government, raising our taxes and usurping our freedoms are coming to an end. I look forward to the day when we are served by honorable people who know and respect the Constitution. Now, I know I’m not alone. 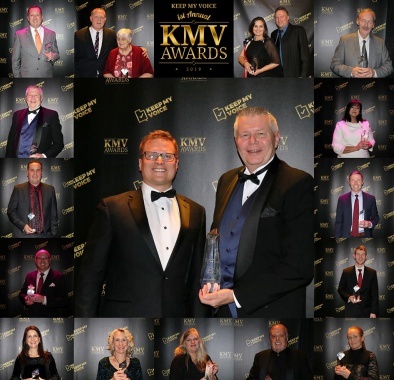 Congratulations to the 2019 KMV Awards winners! After all the briefs were submitted we ended with 68 signers on our eight amici. 68! We are humbled by the nationwide support for our case. Thank you for standing with us. Congratulations! Job well done and thank you! !